72% off the Pair of Floral Splash and Wave 23" Floor Pillows - Just $32.48 Shipped! The Set of 2 Pillow Perfect Floral Splash and Wave 23-Inch Floor Pillows (in Breeze) is currently selling for just $32.48 on Amazon.com! You will be saving 72% off the listed price of $116.99 with this home furnishings deal. 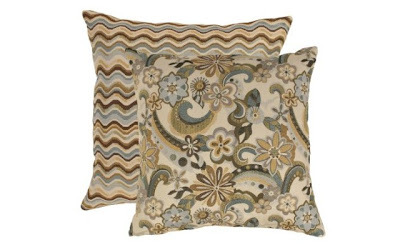 What I like about this pair of floor pillows is the contrasting patterns in coordinating colors. These would be great for sitting around a coffee table for an informal dinner in the living room or for game night!